Installing driveways is work best left to the pros. But that doesn't mean you should give up all responsibility for how this new fixture in your landscaping will turn out. As is the case whenever you hire professionals to work on your property, you should begin the process of hiring a contractor by seeking out references. But even before you do that, you need to do your homework on the various options for driveway materials. Nor should you rely on web research, alone. For such a highly specialized project, you should interview as many professionals as possible: pick their brains for information. The present article on driveways is in no way intended as a substitute for such interviews; rather, it is meant as a springboard for further research. In short, the Q&A that follows should get your mental juices flowing. To that end, we will begin with some sample questions that you can peruse; if one of them piques your interest, click on its link to find out the answer. If you already know the answers to these questions, proceed to the detailed Q&A at the bottom of the page. What are the basic types of driveway materials? How do you rate concrete as a driveway material? How does stone or crushed gravel compare with these other surfaces? What is entailed in repair for asphalt or concrete driveways? I know that you have to seal concrete. But how often? What would you suggest for landscaping? Installing driveways isn't a DIY project. Any advice on hiring contractors? Is installing a driveway gate on a slope a DIY project? What is the best way to remove snow from driveways? Why Is Asphalt Paving Such a Popular Choice as a Surface for Driveways? You are in the planning stages of having a new driveway installed. In pondering the different types of materials that contractors use, trying to decide on which kind is best for your own unique situation and needs, you wonder why so many homeowners have asphalt as a driveway surface. What are its good points? What are the disadvantages of having this type of surface? Asphalt driveways are relatively high in maintenance. If you have been around a fair amount of asphalt surfaces over the years, observing what happens to them over time, you no doubt know that asphalt has a tendency to crack, unless sealed faithfully (see below). Sealing costs money, especially if you have somebody else do the job for you. And as much as it costs to have an asphalt driveway sealed, not sealing it will eventually prove even more costly, because then you will have to repair (or hire somebody else to repair) the cracking that results from not sealing your driveway on time. It is less prone to frost heaves than is concrete. It offers superior ease of snow removal (but read about a puddling problem you may have in late winter at the bottom of this article). Both asphalt and concrete do offer decorative options, although the latter offers more. Unlike concrete, it can be re-layered. Asphalt paving is cheaper to install than is concrete. While asphalt is high-maintenance, repair work on it is at least easier for the DIY'er to perform than is the case with repairs to concrete. It is fairly common knowledge that concrete driveways can be stamped and colored to enhance their appearance, but some may be surprised to learn that pattern-stamping and coloring are also options for asphalt paving. Having patterns stamped in asphalt does, however, cost more than the same operation costs of concrete; you also do not have as many choices for designs. Where winters are severe, two issues come to mind for driveways: ease of snow removal and susceptibility to cracking from frost heaves. Both concrete and asphalt paving rate well on the former, while the relative flexibility of asphalt paving allows it to outperform concrete on the latter. It is also significant that should such damage occur, asphalt paving can be relayered (reducing repair expenses), while concrete cannot. Like concrete, asphalt paving needs to be resealed frequently if it is to last long, so maintenance is a consideration. To learn more, please consult the tutorial on sealing asphalt paving. 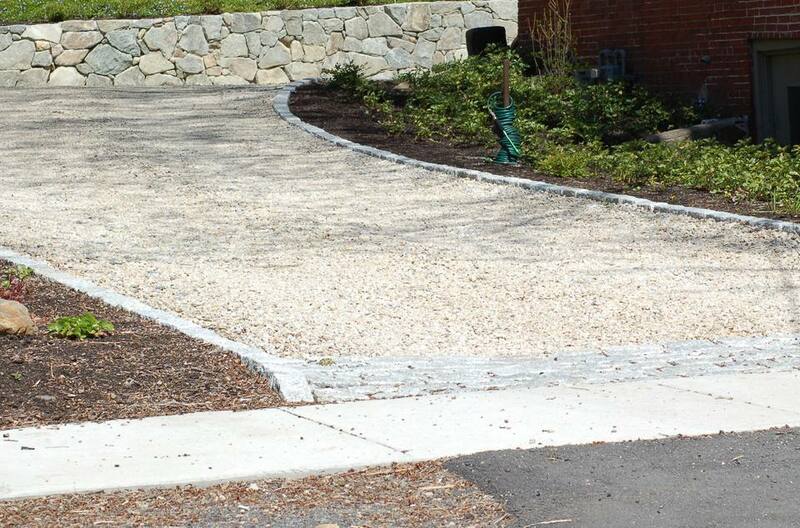 How Do You Rate Cobblestones and Other Driveway Pavers as Driveway Materials? A look that says, "Quality"
Driveway pavers are varied in size and design, ranging from large hexagonal driveway pavers to small rectangular brick driveway pavers and cobblestones. While concrete and asphalt surfaces can be made to mimic the look of driveway pavers, you know it's not the real thing. Authenticity is important to some people. For instance, if creating an "Old World" feel is one of your landscaping goals, there may be no substitute for cobblestone. If you own a brick house, brick pavers will tie the landscape in nicely with your house. Driveway pavers are also durable. Cobblestone driveway pavers, in particular, are practically synonymous with longevity. Even when they do break or become dislodged, repair is simple enough, since they are individual units (unlike concrete or asphalt surfaces). They can be replaced individually so that you're not faced with the prospect of repairing a whole driveway. But one drawback cobblestones have is that it's difficult to remove snow from them, since, unlike other types of pavers, they form an uneven surface (indeed, the uneven surface is part of their Old World charm). They also come at a rather steep price: these pavers, especially the cobblestone kind, are more expensive than the other materials considered here. You've Spoken of Concrete As a Driveway Material, So What Are "Cement" Driveways? This is a simple case of a misnomer -- one that is perpetuated in everyday lingo. Concrete is a mixture, composed of sand, aggregate, and cement. Cement is the binding agent, acting to hold it all together once water is added. People sometimes speak of "cement driveways" to refer to surfaces composed of this mixture. But cement driveways are, more properly speaking, concrete structures. If we wish to be generous, we can say that "concrete driveways" and "cement driveways" are synonymous, for practical purposes. What Does Driveway Maintenance Entail? Let's face it: in the North, snow removal is your biggest driveway maintenance concern. But you can eliminate the need to remove snow from driveways manually by installing the technology known as "snow-melting systems." For a snow-melting system to be installed, your driveway must be made of asphalt or concrete. For more on these so-called "heated driveways," please consult the separate FAQ on snow-melting systems. Of course, few people will choose to go this "techie" route for snow removal. If you're more conventional, consult these snow shoveling tips and learn how to work smarter, not harder, in clearing snow off of your driveway in winter. You've Warned Us About Scams Involving Cheap Asphalt. Are There Legitimate Ways to Save Money? You now know that you should be wary of con artists selling "leftover" asphalt for a bargain (see above), but you may wonder, "Then how can I have an asphalt driveway installed at a cheaper price?" Well, it means expending extra time and energy, but it is possible. This will take a little leg-work and communication on your part. Check to see if any other people in your neighborhood are planning to have asphalt driveways installed. If all of you agree to go through the same contractor at the same time, you'll all reduce the cost for your asphalt driveways. Contractors can offer you a better price in such circumstances because they can buy the material in greater quantities. How Do You Clean a Concrete Driveway? Concrete driveways look great when they're new. But stains such as those from oil, grease, rust, mildew and tire marks rob concrete driveways of much of their luster. Thus the question, Is there any way to remove such stains? This site on how to clean a concrete driveway recommends power washing as the first course of action for any stain except for one caused by recently-spilled oil (for which kitty litter is the best treatment). The same site notes that oil stains that are older are more problematic and probably will not come out completely regardless of what you do, but that Castrol SuperClean provides fairly good results. Do Paved Driveways Have Some Overlooked Disadvantage? The neighbors have a paved driveway on their property, on level land. Here the terminology "paved driveway" denotes one composed of relatively impervious material, such as asphalt or concrete; water doesn't readily percolate through such surfaces. The purpose in this segment is to alert you to a potential problem with such surfaces in regions with heavy winter snowfalls. Note: like many people, for personal reasons, these folks use neither sand nor salt on their property to cope with winter's icy conditions. As mentioned earlier in this FAQ series, paved driveways do, in fact, offer certain advantages in the wintertime over, for example, a driveway composed of numerous small, loose stones. Most notably, you can easily shovel snow (or find someone to plow it) on even surfaces without worrying that you're going to be losing half of your driveway in the process. That's the positive side. But there's a negative side, as well. Being relatively impervious, water will puddle on asphalt or concrete unless there's an outlet for runoff. If your driveway is built on a slope, runoff will typically stream down the surface and onto the street. Even on flat land, rain can usually escape along the left and right sides of the driveway. But what if such access is blocked? This will seem like an odd question to some. But Northerners will know exactly what is meant here. After a winter of heavy snowfall, the neighbor's driveway becomes hemmed in by solid snow banks on three sides. The remaining side―the end that intersects the street―is in the shade, permitting a thick layer of ice to build up. With all four sides thus blocked up, a container of sorts is created to trap the melt that fills up the driveway on warmer days at the end of winter or the beginning of spring. As a result of this situation, the neighbors sometimes end up shoveling water out of their driveway in late winter or early spring. Lest you think there's a typo in that last sentence and that "snow" was meant instead of water, let's be clear: "Water" is no typo. For reasons already stated, the water that accumulates in their driveway when the snow and ice melt has no place to exit. Puddles form during the warmer, daylight hours; then those puddles ice up when the freezing, nighttime hours arrive. Thus a thaw in regions such as New England, the Midwest, and much of Canada can be a mixed blessing. Many an asphalt driveway fluctuates between being a skating rink and a small pond during the thaws of March. Until the water finds a place to go, melting is something of an exercise in futility. That's why these neighbors shovel water: They scoop shovel-fulls of water off their driveway and heave them over the snow banks and onto the lawn. While this practice doesn't solve the problem completely, it does lessen it. Meanwhile, they also chop the ice where their driveway intersects the street to try to open up a channel. Once they have that channel established, they will be able to push the water out of their driveway (using either a push broom or a shovel) in waves, letting it flow down the road and into the sewer. Is there a better solution to this problem? Well, one alternative is to stay ahead of ice build-up where the driveway meets the road. But there's work involved on your part either way. It's not a question of whether you'll pay the Piper, but of when.